Test yourself on the highway code with 50 questions from the DVSA revision question bank relating to following distances, pelican crossings, headlights, and responding to other road users. If you see a vehicle with a flashing green beacon approaching, allow it to pass when you can do so safely. Be aware that someone’s life could depend on the driver making good progress through traffic. It’s important that you reduce your speed. Passing too closely at speed could startle the horse and unseat the rider. You should be aware of where all the warning lights and visual aids are on the vehicle you are driving. If you are driving a vehicle for the first time you should take time to check all the controls. Staying back will increase your view of the road ahead. This will help you to see any hazards that might occur and allow you more time to react. These signs only apply to trams. They are directed at tram drivers but you should know their meaning so that you’re aware of the priorities and are able to anticipate the actions of the driver. In good, dry conditions an alert driver who’s driving a vehicle with tyres and brakes in good condition, needs to keep a distance of at least two seconds from the car in front. By keeping well back you will increase your width of vision around the rear of the lorry. This will allow you to see further down the road and be prepared for any hazards. Keep a steady course to give the driver behind an opportunity to overtake safely. If necessary, slow down. Reacting incorrectly to another driver’s impatience can lead to danger. Emergency vehicles use blue flashing lights. If you see or hear one, move out of its way as soon as it's safe and legal to do so. Emergency vehicles often travel at high speed. You should help their progress by pulling over and allowing them to pass. Do so safely and legally. Don’t stop suddenly or in a dangerous position. Diesel fuel is especially slippery if spilled on a wet road. At the end of a dry spell of weather you should be aware that the road surfaces may have a high level of diesel spillage that hasn’t been washed away by rain. Horses can become startled by the sound of a car engine or the rush of air caused by passing too closely. Keep well back and only pass when it is safe; leave them plenty of room. You may have to use the other side of the road to go past: if you do, first make sure there is no oncoming traffic. If the driver behind is following too closely there’s a danger they will collide with back of your car if you stop suddenly. You can reduce this risk by slowing down and increasing your safety margin ahead. This reduces the chance that you will have to stop suddenly and you can spread you braking out over a greater distance. This is an example of defensive driving. The electronic device will automatically detect that the pedestrians have reached a safe position. Don’t proceed until the green light shows it is safe for vehicles to do so. You should only flash your headlights to warn others of your presence. Don’t use them to, greet others, show impatience or give priority to other road users. They could misunderstand your signal. Pull over in a place where the ambulance can pass safely. Check that there are no bollards or obstructions in the road that will prevent it from doing so. Give way to buses whenever you can do so safely, especially when they signal to pull away from bus stops. Look out for people leaving the bus and crossing the road. If you wish to turn right into a side road take up your position in good time. Move to the centre of the road when it’s safe to do so. This will allow vehicles to pass you on the left. Early planning will show other traffic what you intend to do. Newly qualified, and particularly young drivers, are more vulnerable in the first year after passing the test. Inexperience plays a part in this but it’s essential to have the correct attitude. Be responsible and always show courtesy and consideration to other road users. Look out on the approach especially for children and older pedestrians. They may walk across without looking. Zebra crossings have flashing amber beacons on both sides of the road, black and white stripes on the crossing and white zigzag markings on both sides of the crossing. Where you can see pedestrians waiting to cross, slow down and prepare to stop. Puffin crossings have infra-red sensors which detect when pedestrians are crossing and hold the red traffic signal until the crossing is clear. The use of a sensor means there is no flashing amber phase as there is with a pelican crossing. A long lorry with a heavy load will need more time to pass you than a car, especially on an uphill stretch of road. Slow down and allow the lorry to pass. Use the full beam headlights only when you can be sure that you won’t dazzle other road users. Large, long vehicles need extra room when making turns at junctions. They may move out to the right in order to make a left turn. Keep well back and don’t attempt to pass on the left. Competitive driving increases the risks to everyone and is the opposite of responsible, considerate and defensive driving. Defensive driving is about questioning the actions of other road users and being prepared for the unexpected. Don’t be taken by surprise. Try to be ready for the unexpected. Plan ahead and learn to anticipate hazards. You’ll then give yourself more time to react to any problems that might occur. Be tolerant of the behaviour of other road users who don’t behave correctly. Allow the sheep to clear the road before you proceed. Animals are unpredictable and startle easily; they could turn and run into your path or into the path of another moving vehicle. ‘Tailgating’ is used to describe this dangerous practice, often seen in fast-moving traffic and on motorways. Following the vehicle in front too closely is dangerous because it: restricts your view of the road ahead, and leaves you no safety margin if the vehicle in front slows down or stops suddenly. Your horn must not be used between 11.30 pm and 7 am in a built-up area or when you are stationary, unless a moving vehicle poses a danger. Its function is to alert other road users to your presence. You should consider drivers behind as brake lights can dazzle. However, if you are driving in fog it’s safer to keep your foot on the footbrake. In this case it will give the vehicle behind extra warning of your presence. Try not to hold up a queue of traffic. Other road users may become impatient and this could lead to reckless actions. If you’re driving a slow-moving vehicle and the road is narrow, look for a safe place to pull in. DON’T wave other traffic past since this could be dangerous if you or they haven’t seen an oncoming vehicle. If people are waiting to use a pedestrian crossing, slow down and be prepared to stop. Don’t wave them across the road since another driver may, not have seen them, not have seen your signal and may not be able to stop safely. To measure this, choose a fixed reference point such as a bridge, sign or tree. 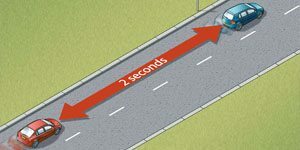 When the vehicle ahead passes the object, say to yourself ‘Only a fool breaks the two- second rule.’ If you reach the object before you finish saying this, you’re TOO CLOSE. A toucan crossing is designed to allow pedestrians and cyclists to cross at the same time. Look out for cyclists approaching the crossing at speed. A green flashing beacon on a vehicle means the driver or passenger is a doctor on an emergency call. Give way to them if it’s safe to do so. Be aware that the vehicle may be travelling quickly or may stop in a hurry. A flashing amber light is shown at pelican crossings, but puffin crossings are different. They are controlled electronically and automatically detect when pedestrians are on the crossing. The phase is shortened or lengthened according to the position of the pedestrians. Don’t drive or park in a bus lane when it’s in operation. This can cause disruption to traffic and delays to public transport. When learning to drive it is a good idea to practise filling your car with fuel. Ask your instructor if you can use a petrol station and fill the fuel tank yourself. You need to know where the filler cap is located on the car you are driving in order to park on the correct side of the pump. Take care not to overfill the tank or spill fuel. Make sure you secure the filler cap as soon as you have replaced the fuel nozzle. If you are using diesel, or are at a pump which has a diesel facility, be aware that there may be spilt fuel on the ground. Fuel contamination on the soles of your shoes may cause them to slip when using the foot pedals. A doctor attending an emergency may show a green flashing beacon on their vehicle. Give way to them when you can do so safely as they will need to reach their destination quickly. Be aware that they might pull over suddenly. If you stop for pedestrians and they don’t start to cross don’t wave them across or sound your horn. This could be dangerous if another vehicle is approaching which hasn’t seen or heard your signal. While the pedestrians are crossing don’t encourage them to cross by waving or flashing your headlights: other road users may misunderstand your signal. Don’t harass them by creeping forward or revving your engine. Don’t enforce the speed limit by blocking another vehicle’s progress. This will only lead to the other driver becoming more frustrated. Allow the other vehicle to pass when you can do so safely. Pelican crossings are signal-controlled crossings operated by pedestrians. Push- button controls change the signals. Pelican crossings have no red-and-amber stage before green. Instead, they have a flashing amber light, which means you MUST give way to pedestrians already on the crossing, but if it is clear, you may continue. There are times when other drivers make incorrect or ill-judged decisions. Be tolerant and try not to retaliate or react aggressively. Always consider the safety of other road users, your passengers and yourself. The narrow wheels of a bicycle can become stuck in the tram rails, causing the cyclist to stop suddenly, wobble or even lose balance altogether. The tram lines are also slippery which could cause a cyclist to slide or fall off. Be extra-cautious, especially when your view is restricted by hedges, bushes, walls and large vehicles etc. In the summer months these junctions can become more difficult to deal with when growing foliage may obscure your view. We'll email you a different study test every day for two weeks to help you ace your test.